In a city where football is one of the most celebrated and passionate in the world, Napoli has introduced to the Italian competition a dynamic, thrilling brand of football focused on high pressure, quick passing and ball retention. The icon of this style, Pep Guardiola calls Napoli performances “the most beautiful football in Europe”, going as far as to say that they are probably the best side he ever faced. Fluid yet solid, exciting yet strict. Maurizio Sarri has created a team that can associate results with pleasing play; they managed massive 91 points last season which yet proved inferior to Juventus supreme dominance. Sarri, as a result, diverted his eyes towards the Premier League grabbing his midfield maestro- Jorginho- by hand. It was no surprise as both have a similar understanding born out of a shared interpretation of how football should be played. But amid all the neat passing triangles ‘Sarriball’ proposes, Jorginho had a specific role: he is the grand operator, pulling strings for others, making sure their focus is forward not sideways; as his Sqwuaka stats for forward passes reflect. 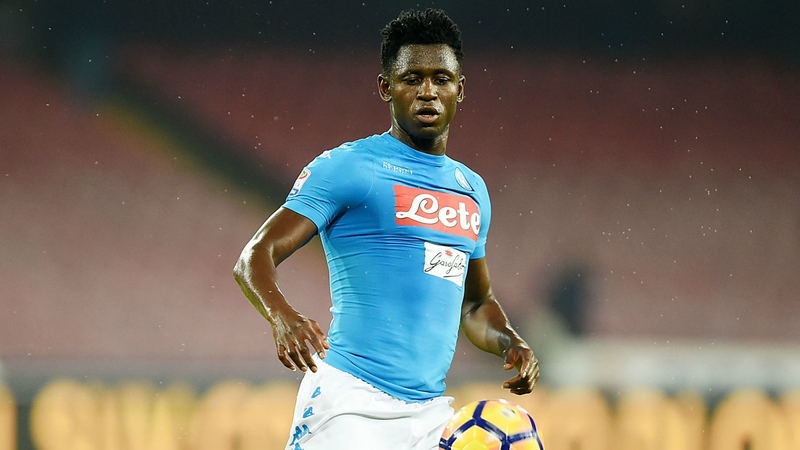 Despite Jorginho’s Xavi-esque emphasis on the team, Sarri hasn’t overlooked the hidden gem in his squad, Amadou Diawara. The 19 year-old was set to replace Jorginho in the starting line-up in crucial knock-out Champions League games against Real Madrid. He then paved his way for other age-defying performances against teams as huge as: Juventus and Manchester City. With the level of performance Jorginho was offering, Diawara didn’t get the chance to build on that. However, his time on the pitch was enough to make his presence known and give a strong impression that the southern club wouldn’t face the supposed uphill task when trying to compensate Jorginho’s big money move. Review any sport at any level and you will be aware of the struggles of making it to the top. The flair, dedication and luck required rules out the majority, keeping just a fortunate few. As late as 2014, Amadou Diawara was part of the former majority and well away of the fortunate few; he has already featured for local sides Syli Authentic and FC Séquence before he ended up playing in his hometown church team in Conkary, Guinea at the age of 16. His hidden talent was spotted by scouts Numukeh Tunkara and Roberto Visiani, who pushed him for a move across the Atlantic to play for club San Marino Calcio competing in Serie C- Italy’s third division. Diawara didn’t have the best of starts to his professional career, San Marino finished rock bottom of Serie C in 2014/2015, with Diawara making 15 first team appearances. In that time, however, he caught the eye of Bologna’s director of football and one of Italy’s great talent scouts -Pantaleo Corvino, who then paid £420,000 for his services in July 2015. The young midfielder made his Serie A debut in the first weekend of the new season and swiftly became a key member in midfield. The club had a difficult start to the Serie A campaign and coach Delio Rossi was sacked with the Rossoblù stuck on six points after ten games. Bologna started to fly under new boss Donadoni, though, with a 3-2 victory against in-form Napoli a real statement. So too was Diawara’s performance, complete with a precise long pass for Mattia Destro’s opener. His defensive excellence truly shone in the way he neatly intercepts the ball, close spaces and stymies attacks time and time again; acting as a ball-winning midfielder in Donadoni’s system, while still showing potential in the passing department. Many clubs were interested in his signing, and despite receiving more luxurious offers, he thought Napoli is the perfect place where he can reach the next level on technical and tactical basis. Napoli reportedly paid £16million to lure the young midfielder who despite making only 40 appearances for the club, has shown big potential; highlighted by age-defying performances against Real Madrid at the Bernabeu and Manchester City at the Etihad Stadium in the Champions League. Typically a holding midfielder, some individuals playing his role are often referred to as ‘destroyers’ with the goal of causing mayhem and eliminating rhythm in midfield. What makes Diawara so special is that he is a two-way player; meaning he can impact a match just as much in the attacking phase. Strong on the ball as well as off it, he’s a major asset for any side as holding midfielders who can charge higher up the pitch holding the ball, as he does, are a rarity. His physicality is good enough to excel in his defensive responsibilities; his time at Bologna has shown that he can prove as a star in this role. However, this wasn’t the only reason why Napoli were eager for his signature, Diawara has a knack for distributing the ball all over the pitch; he is a supreme passer of the ball both long and short, his intelligence and ability to resist opposition’s press are standout attributes that elevate him far beyond rising prospects of his age. Those key traits helped him settle in a very technical side like Napoli, which often sets up their offensive phase through gradual build-up from the back to the front. Their center-backs can carry the ball forward. The midfielders being the main pass targets. In this case, having a player who can both: intelligently deliver the ball, and avoid any turnover in position, prove to be pivotal. In the above image, we see one of those situations where Inter players are applying the press on Napoli’s backline. Diawara dropped in a good position to provide the easy way out of the applied press. Being the first element of connection between the defensive and medium lines; trying to create space for Hamsik move, which he did in an intelligent manner as we see in the next image. During his Napoli spell, not only did Diawara show his ability in placing himself in front of the defensive line, covering the 2 offensive midfielders considering the 4-3-3 tactical system used by the manager, but also justified his tip-top qualities and awareness, thriving in this technically demanding position despite replacing one of the most influential registas in Italian football in Jorginho. As noted earlier, one of the key strengths Diawara currently has would have to be his outstanding versatility. Throughout his short professional career, the midfielder was able to make his voice heard in all phases of the game. He’s a great tackler and settles in well in a defensive midfield role, also he proved to be instrumental in setting attacks for his club, either when replacing or sharing the midfield with Jorginho. With regards to his technical abilities, he has been typically praised for both his passing and dribbling ability. He uses his dribbling ability confidently to bypass the opposition’s press in the build-up phase; also he finds no problem controlling the ball in tight spaces. When he has the ball, the midfielder is known to play confident short passes, same applies when attempting long ones, and the 21-year-old can even create clear-cut chances for forwards, thanks to his impressive vision. In the situation below, we can see him supporting the offensive teammates and allowing the team to keep working with the ball. As soon as he gets the ball, he’s able to explore Callejon movement in between the lines, delivering an accurate long pass that yielded a dangerous chance for Napoli. As much as his ball-winning abilities allow him to serve his team on the back foot, it proves to be crucial in his side pressing system. Due to his great supporting skills in the construction phase, he is constantly near the ball. As his team loses position, his positioning allows him to intercept or obstruct opposition higher up the pitch, as we can see in the next image. He’s able then to deliver the ball well to his teammates to start another attack, or pick a forward pass by himself when possible. There haven’t been too many errors committed by Diawara in his short senior career so far, but one main area that he can improve in is his ability to maintain his level of performance throughout the season. The young midfielder hasn’t got many opportunities to work on that at Napoli, with Jorginho being the side’s first-choice in the league. Diawara did play most of the games in 2015/2016 season with Bologna, it was an overall great season for the player, but, towards the end of the season, specifically against Roma in April, he had experienced a slump in form which didn’t get much better till the end of the season. It’s an aspect that can only be solved with playing more games; it’d be lazy to forget that the season at Bologna was his first in the top level though. Also for holding/central midfielder, a good shooting range and accuracy can only be welcomed with open arms. Diawara rarely attempts to shoot from long range, and when he does, his attempts often are far away from target or too easy for the keeper. Apart from that, he faces no major issues with his style of play, but he did face a problem with competition which held back his playing time. Diawara had one of the most in-form and effective registas in Italy to replace. But with Jorginho’s departure to the Premier League, it’s his very chance to step out of the shadow and get his sketchy rise meteoric.